My mother was the best lace knitter I ever known. She created cobweb like table cloths from a thin cotton thread. I always admired her concentration when she knitted. She had to count her stitches and remember where she was at each moment otherwise she would have to frog it. Can you imagine frogging a huge lace table cloth? That would be very frustrating to me. I knit only very easy lacy knits - nothing as complicated as my mom did. But one day I will try to knit what she knitted, just to go through that process. 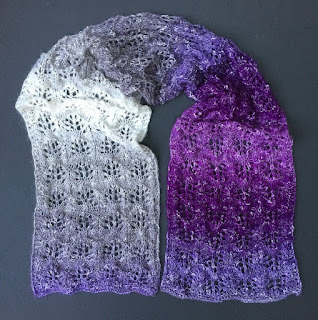 CLICK HERE to watch my video of this fairly easy lacy stitch pattern you could use in your projects. 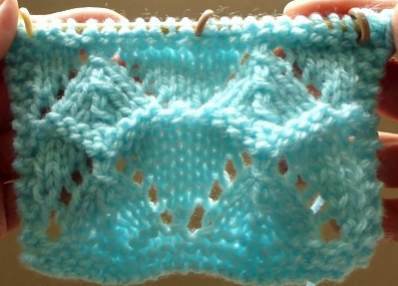 This video shows you how to knit each row in a great detail. I am in a process of finishing recording a video where I am using this particular lacy pattern for an American Girl Doll Dress. So stay tuned. You will work on multiples of 10 sts, plus as many stitches as you need for each side. I knitted this piece using 24 stitches = 2 sts for one side/edge, 20 stitches for the pattern (2 repeats), and 2 sts for second side/edge. This pattern repeats every 10 rows. The directions are for the "24 sts sample", just like in the video. CO 24 sts. and knit 4 or more rows of base, depending on what you are trying to achieve - ie. ribbing for a sweater, or garter stitch for scarf... then proceed with the 10 rows of pattern, which you will repeat as many times as you need before you bind off.